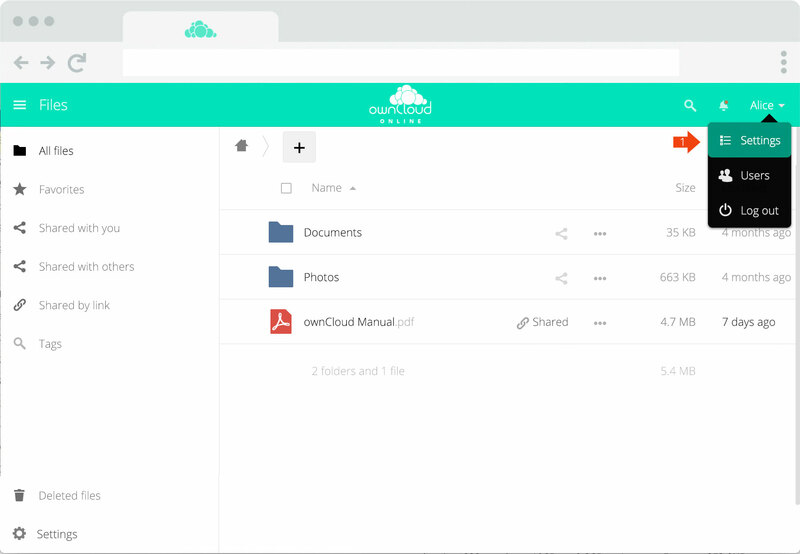 ownCloud Online provides a separate overview page where all file and folder actions are listed in a comprehensive stream. From creation of new files or folders, to file or folder changes, updates, restores from trash bin, sharing activities, comments, tags or downloads from public share links –like known from social networks all file or folder related actions are tracked and displayed in one place for the user to review. On top of that every user is able to enable email notifications about those file actions which are sent in a user set interval. Alice clicks on „Settings“ in her user menu (1) to specify her notification settings. In the „General“ tab (2) she scrolls down to see all notification settings. These options affect only her personal account. For a detailed description to each option see the „Notification Options“ below. Additionally to mail notifications a small bell appears in the header (3) notifying Alice about important events. To see the Activity Stream, which lists all actions to files Alice watches, she clicks on „Activity“ in the file menu (4). To see a detailed list about notification settings see the table below. See the „Sharing Files“ section on how to collaborate effectively with others. Choose on which channel you want to be notified about. „Notify via email“ or „Notify via stream“ lets you choose which way you want to go. You can determine how often the system should send you a summarized report about your file actions. 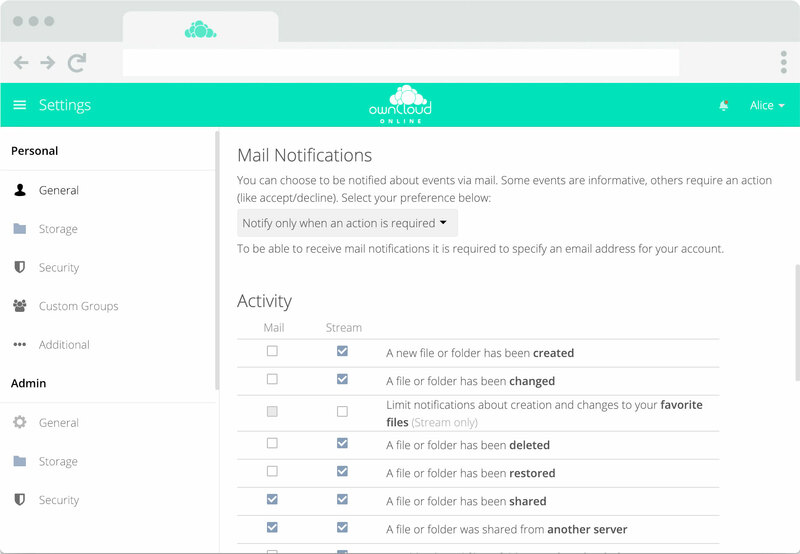 Select an hourly, daily or weekly digest or even turn off mail notifications completely. Notifications are customizable according to your needs. A new file or folder is created in one of your watched folders. A file or folder in one of your watched folders has changed. Limit notifications about creation and changes to your favourite files. A file or folder has been deleted. A watched folder/file or a folder/file inside a watched folder was deleted. A file or folder has been restored. A watched folder/file or a folder/file inside a watched folder was restored (see Versioning). A file or folder has been shared. A file or folder was shared with you or a file or folder you are watching was shared. A file or folder was shared from another server. A file or folder was shared from another server via Federated Sharing. A public shared file or folder was downloaded. A file or folder shared via a public link was downloaded. See Sharing Files for details to public links. Infected file has been found. A file you uploaded was detected as infected by the internal virus protection. System tags for a file have been modified. A tag was added, edited or removed from a file or folder you are watching. List your own file actions in the stream. List your own file or folder actions in the activity stream. Notify about your own actions via email. Include your own file or folder actions in the mail report. Create custom sharing segmentations on the fly. For a more efficient workflow without the need of an administrator. 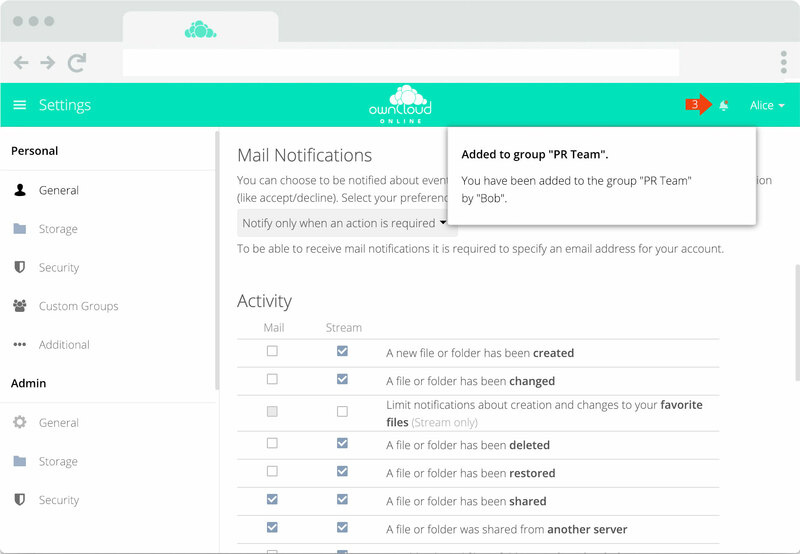 Easily share and collaborate with external people using only their email address. No additional paid user accounts are needed and even the mobile and desktop clients can be used. 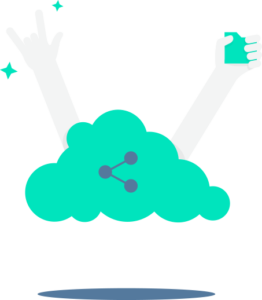 Share files and collaborate with others. Digital collaboration made easy and comfortable. The most secure content collaboration platform for your company.